**Thank you to Mrs. Freshley's for sponsoring today's FUN post! Happy Valentine's Day! Valentine's Day is a day to spend showing your "Sweet" just how much you love and appreciate them! If you are not with anyone you may see as your "Sweet", you might see this holiday as pointless. I am here to share a few treats with you, so you'll feel great whether you have a "Sweet" or not! Mrs. Freshley's knows just how to fill you belly and warm your heart this Valentine's Day! Making these treats was a lot of fun. I had no problem assembling them and my husband and children had no problem eating them. The neighbor kids must have known I was putting together some goodies because they came running too. My favorite to make was Valentine's Dreamies. These take a tiny bit of prep work, but so worth it! Combine cut strawberries, sugar and vanilla in medium bowl. Set in refrigerator for at least an hour to allow the juices to come out of strawberries and make a delicious sauce! 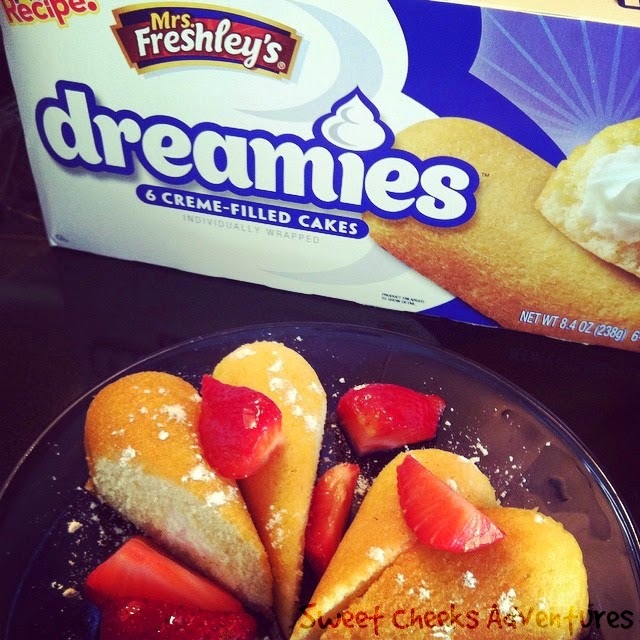 Slice Mrs. Freshley's Dreamies diagonally and place them in a heart shape. Top the Dreamies with strawberries and sauce. If you desire, drizzle with chocolate syrup to add a little something extra special! Place Stencil on top of a Mrs. Freshley's Oatmeal or Fudge creme. Sift some powdered sugar over the stencil and Creme. Remove the stencil, revealing the beautiful design! 8 Mrs. Freshley's Chocolate Bells, halved. Dip strawberries in chocolate. 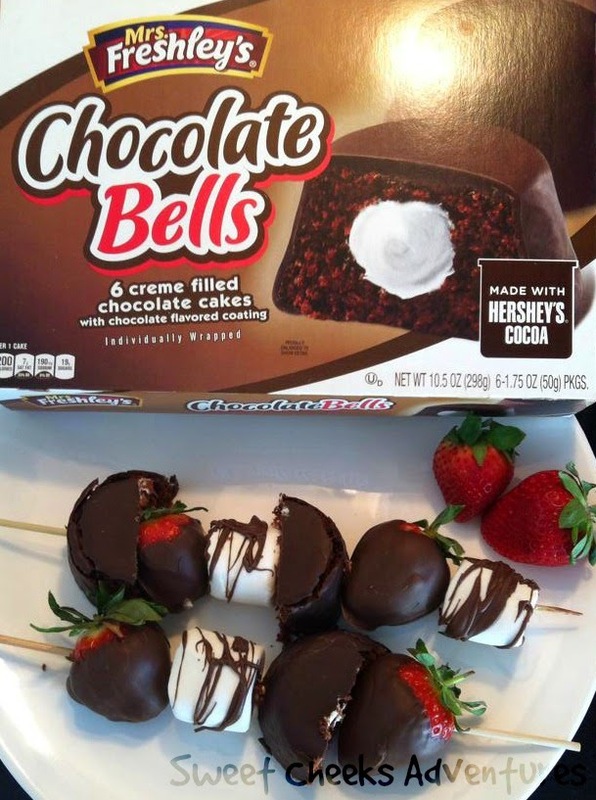 Place one halved Mrs. Freshley's Chocolate Bells on a wooden skewer. Next place one strawberry, followed by one marshmallow. Repeat steps until skewers are full. Prepare melting chocolate according to package and drizzle over kabobs. These treats are so sweet and perfect for Valentine's Day! They're so easy to assemble and so fun to eat. 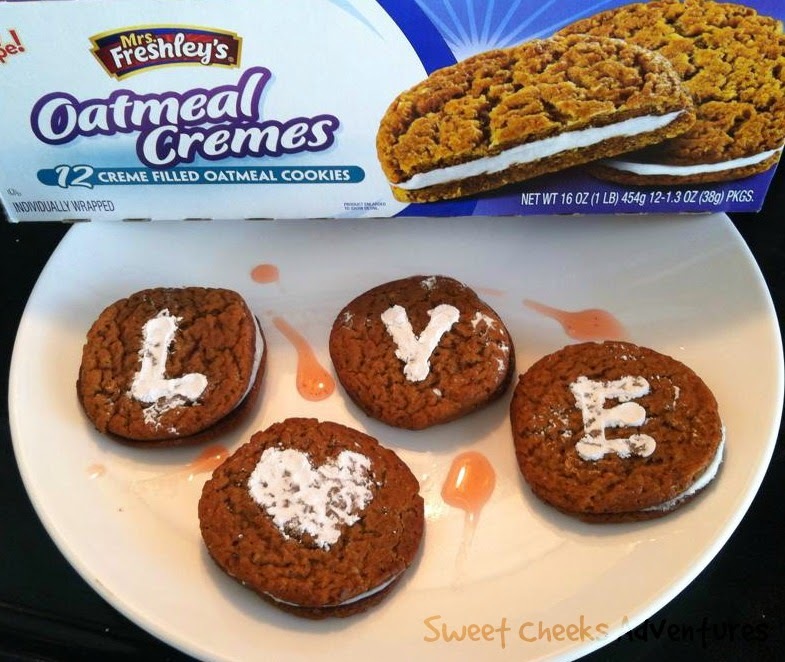 Whip these up and share with your "Sweet" on this Holiday of Love. Yummy in the tummy, I'll have to make some of these for my sweetheart!!! We love to eat, so I need to stock up on these sweet treats! They all look amazing. All of these sound like great desserts. I love what you did with the Dreamies, that sounds really good! I have never heard of this brand. They look like a great sweet cheat treat. These are great ideas for semi-homemade special treats! I love the chocolate lover's kebab idea! So simple, but so very tasty! I love these ideas. They do make great Valentine's day desserts. Mrs Freshley's looks pretty divine. These are really cute ideas for ways of incorporating them into Valentine's Day treats. oh these all look stupendous! These look yummy. I think my staffs kids would like them. These look yummy. My staff's kids would love these. I don't think I have ever heard of this brand before, but it looks tasty! I like your skewers too. We should make them on Saturday for Valentine's Day! I love the idea of chocolate kababs. It would be perfect for any kind of get-together. I have never heard of this brand. I will need to check it out the next time I go shopping! Those chocolate kabobs look delicious. I think I might make some of those sometime for a party!